Clyde Beaman Edwards, Jr. passed away on the 12th day of November, 2018, at the age of 82, from complications of congestive heart failure. He was born April 24, 1936, in Canton, Mississippi, to the late Clyde Beaman and Ethlyn (Tucker) Edwards. Clyde graduated Canton High School and then earned his Bachelor’s degree in Banking and Finance from the University of Mississippi. He served as President of the Sigma Alpha Epsilon (SAE) Fraternity his senior year. He continued his studies at Louisiana State University’s Graduate School of Banking. For more than 30 years, Clyde worked in the banking industry. 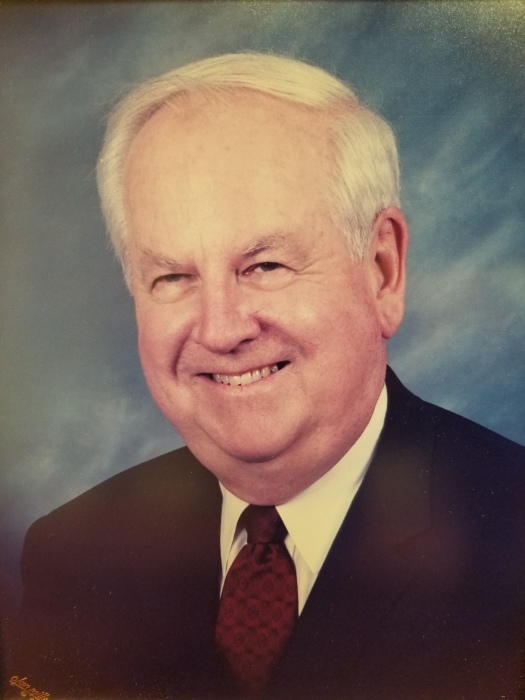 He began his career with First National Bank of Jackson, which later became Trustmark National Bank where he served as Executive Vice President and Chief Credit Officer. After completing his banking career, he became a partner in an asphalt construction company, Adcamp, Inc. He was elected to the original Board of Directors for the Madison County Foundation, the private arm of Madison County Economic Development Authority. This first Board laid the initial groundwork for the way that the Foundation, a private sector organization, would operate and support the public sector economic development for the county. He traveled throughout the United States and internationally with this group and assisted with fundraising and marketing. He was instrumental in Madison County becoming a part of the Metro Economic Development Alliance. Clyde was very civic minded and the success of Adcamp, Inc. brought him numerous opportunities for service throughout the Metro Jackson area. He earned many accolades and awards for his service. One award he valued deeply was his recognition as Chairman for the very successful 1982 United Way Fundraising Campaign. On November 23, 1963, after a brief two-month courtship followed by a two-month engagement, Clyde married the love of his life, Carolyn Yvonne Moss of Tchula, Mississippi. Clyde and Yvonne owned a farm west of town where he raised cattle and different row crops throughout the years. Clyde was a lifetime member of First Baptist Church Canton. He served on the Building Committee for the First Baptist Church Family Life Center, on the Budget Finance Committee, and numerous other committees throughout the years. It was in First Baptist Canton that Clyde and Yvonne raised their three children. A loving, devoted, and affectionate husband, father, and grandfather, Clyde is survived by his wife of 55 years, Yvonne Moss Edwards; son Clyde (Monica) Edwards, III of Canton; daughter Yvette (Chip) Cook of Madison; and daughter Allison Edwards of Atlanta; grandsons Wen and John Tucker Cook; granddaughters Ella and Lila Edwards, and numerous extended family members. Visitation will be at Breeland Funeral Home, Canton, Mississippi, from 5:00 – 7:00 PM on Thursday, November 15, 2018 and at 9:30 AM on Friday, November 16th until the service at 11:00 AM at First Baptist Canton. Interment will immediately follow at the Canton Cemetery. Memorial contributions may be made to First Baptist Church Canton, Canton Academy, or a charity of your choice.